You are entitled to cancel your order and return the goods within 7 working days for a full refund, including the cost of delivery. Do this by contacting us by email or telephone (see contact us page). Your refund will be paid within 30 days. You are responsible for the cost and risk of loss or damage when returning the goods, so you should take out enough postal insurance to cover their value. This cancellation policy does not affect your rights when we are at fault - for example, if goods are faulty or mis-described. Any goods returned should be in saleable condition, with any seals and wrappers unbroken. These terms apply to your order. We may change our terms and conditions at any time. None of these terms affect your legal rights and these are not diminished in any way. If any term is held to be invalid under any applicable statute or rule of law, that term is automatically omitted from the terms to minimum extent necessary to comply with the law and without affecting the validity or enforceability of the remainder. If you live outside the USA, please be aware that local customs or import duties may be charged when your parcel reaches your country. We have no control over these charges, so unfortunately cannot predict what they will be. 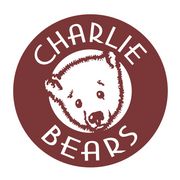 Any orders placed could be subject to cross border or exchange fees by your card issuer, and Charlie Bears cannot reimburse for any fees assessed by your card-issuing bank. Every effort is made to ensure that the products we supply correspond as closely as possible to those displayed in our store or online, but due to the handmade nature of our products there might be slight variations. No responsibility can be accepted for these variations. These could include, but are not limited to, slight differences in shades of fabric or dimensions of products. Please bear in mind that computer browsers may present colors slightly differently. If an item is not eligible for return, this will be stated on the product description page.